As a marketer, the glory of unifying marketing and sales is that you are credited, as well as responsible, for generating results that affect the bottom line. This is the essence of pipeline marketing. Marketers know how important their work is, but how do they prove it when marketing-automation platforms are often siloed from executives, making it difficult for leadership to see how valuable their contribution is to revenue growth? Part of having a unified marketing and sales team is making sure your marketing metrics are established in the system that your executive team uses for decisions making. For example, many organizations use Salesforce as their primary source for business intelligence. Ergo they need to make sure the marketing data they find valuable for decision-making is in Salesforce. If leadership can see the value, your efforts will be praised, financially supported and appreciated. For marketers, demonstrating to leadership that you are a marketing machine looking to drive quantitative results throughout the entire company—and deliver the metrics executives are looking for—will help you establish yourself as a leader in your company. 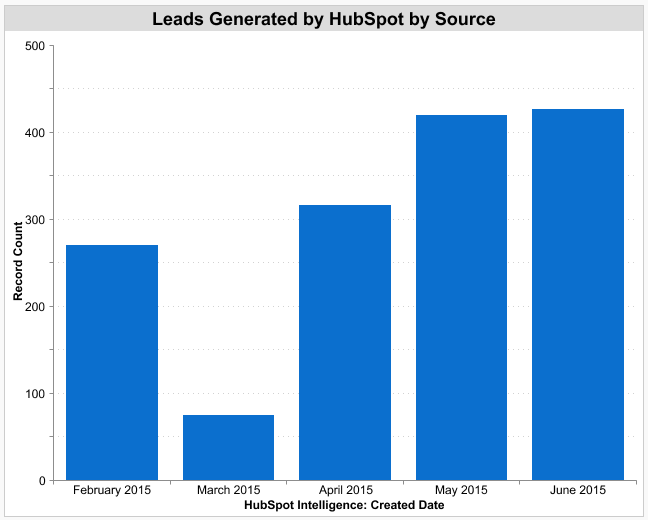 How many leads have your marketing efforts generated this month? Keeping the funnel full keeps the sales team happy and busy. 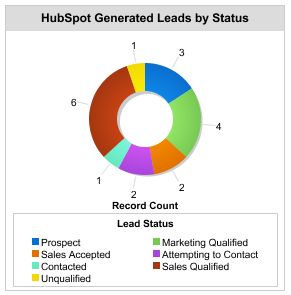 What is the status of the leads your marketing efforts generated? Quality leads progressing through the funnel generate high-probability opportunities. Not only that, but monitoring lead status helps ensure that marketing-sourced leads are being nurtured appropriately. 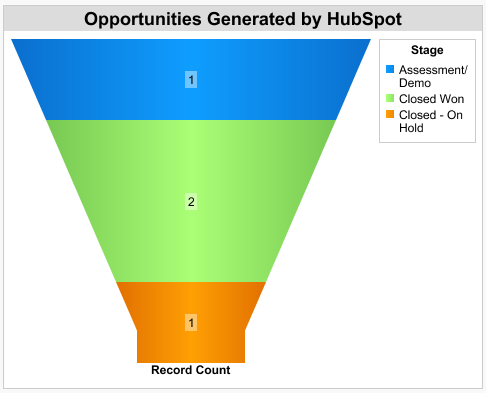 What stage of the sales funnel are your marketing-generated opportunities? A full funnel results in opportunities at all stages of the sales process, resulting in a steady flow of closed deals. 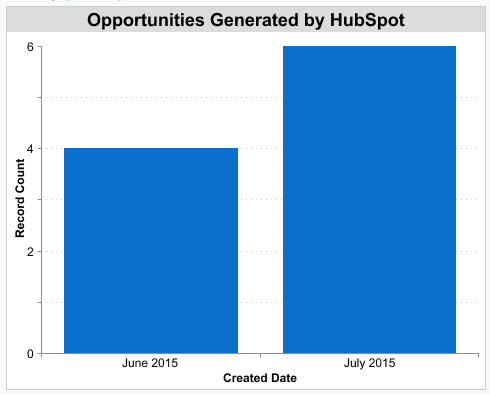 How many of the leads your marketing department generated converted into opportunities? Lead conversion is key in proving your marketing-generated leads are the right leads. Which marketing campaigns are generating the most opportunities? Successes and failures from past campaigns can be used to develop the perfect campaign strategy. 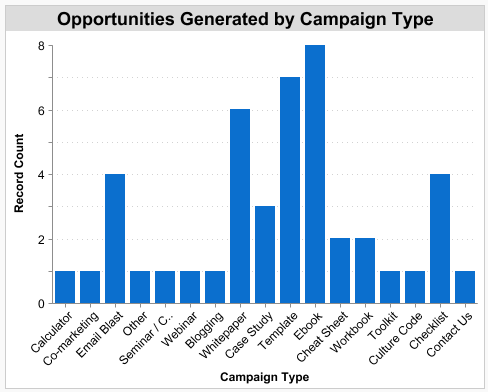 Which marketing-campaign types are generating the most opportunities? Campaign-type analysis gives valuable insight into your buyer personas and to which offers and strategies they respond. 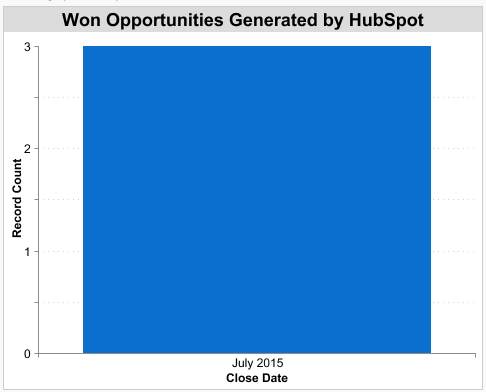 How many of the opportunities generated by your marketing efforts closed? Won opportunities prove with strong quantitative backing that your marketing is working. 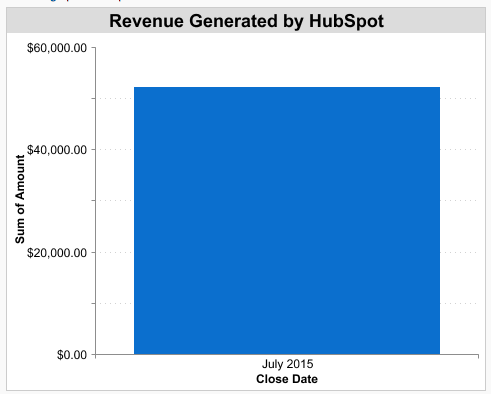 What is the total revenue your marketing efforts have generated? Your CFO is likely willing to give you creative freedom in your marketing efforts so long as you can show him or her the return on investment at the end of the day. 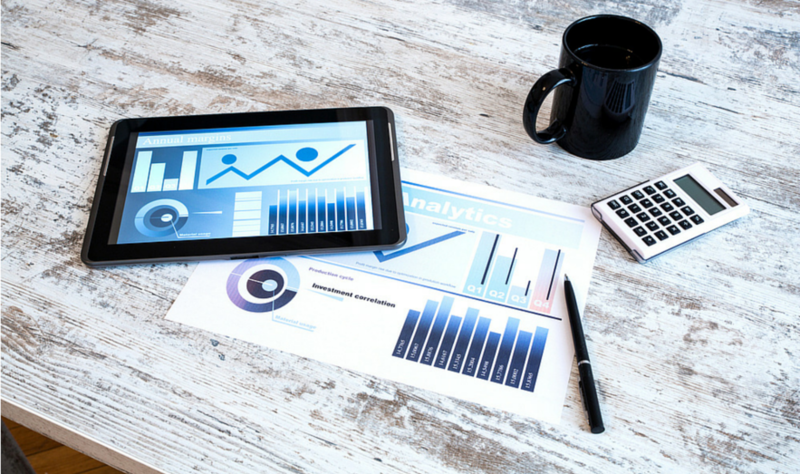 How much revenue is each of your marketing campaigns generating? Analyzing each campaign by a revenue vs. cost standpoint can provide insight into how much time, money and resources should be invested into campaigns to provide the largest ROI. Growth-driven marketers should base everything they do on how campaigns are contributing to revenue and giving sales the best chance to close deals. These dashboards are a great place to start in illustrating this mindset and helping you make better decisions about your marketing initiatives. So what are you waiting for? Time to talk to your Salesforce administrator and ask for these to be set up ASAP. If you are already a Salesforce and HubSpot customer, many of these reports are generated automatically with the latest API update and can be accessed in Salesforce by going to Reports -> HubSpot Dashboard (Installed Package) -> HubSpot Dashboard. If you need any help getting these set up, interpreting them or making some tweaks, don't hesitate to reach out. Will is a former New Breeder.